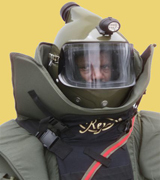 The bomb helmet incorporates the latest materials technology and molding techniques to provide a helmet that is not only ballistically superior but also shaped to fit the wearer’s head. It is also designed to fully integrate within the collar of the suit without impeding the lateral and rotational movement of the head. • Multi impact laminated visor - Anti ballistic visor made from hardened acrylic polycarbonate laminate. *Suspension harness – webbing and ballistic nylon. *Flashlight: A bracket and small flashlight is provided on the front of the helmet which is self powered . 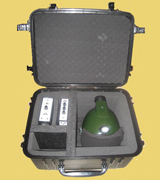 Incorporated in the helmet is the a communication set consisting of an integral speaker and microphone. The Microphone for the ambient sound is built into the side of the helmet allowing the operator to listen to all outside sounds and or the rest of the team using the control switches on the control box .The volume control is also situated on the control box. 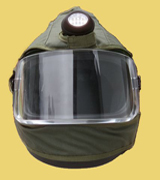 Also incorporated in the helmet is the Air Ventilation system, which directs the flow of forced fresh air over the top of the helmet liner, across the visor and down over the operator’s face ensuring efficient demisting and clear view. At the back of the helmet there is the fan and filter intake housing which blows a cool stream of air round the inside of the helmet and onto the wearer’s face ensuring that the visor does not steam up. 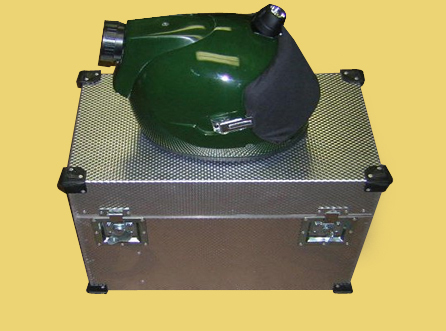 The helmet is made from a sandwich construction system developed by and unique to the company and is fully adjustable by means of the three-point suspension.